A biotech-based process has produced ultrathin computer memory. Nara Institute of Science and Technology researchers claim that the process could lead to much smaller and thinner computers in the future. Using ferritin, a globular protein complex found in mammals that stores iron inside its structure, researchers found a way to deposit metal memory cells on substrates without heat. Once the ferritin has formed an ordered arrangement, UV light destroys the protein, leaving the metal behind. This should allow the use of much thinner substrates. 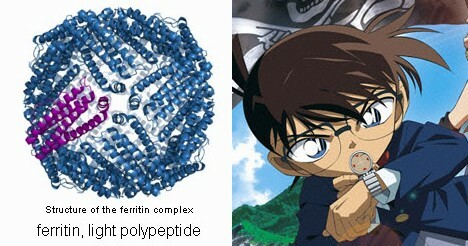 The researchers claim to be directly inspired by the science-fictional detective Manga Detective Conan; the young hero of the series uses a variety of special devices to help him. In particular, he uses computerized eyeglasses. His glasses are cool (see another picture of his tracing glasses); also check out his voice-changing bowtie which allows him to easily imitate anyone's voice. Via Ferritin proteins yield ultrathin computer memory. Thanks to CyberStrike for pointing out this story.